A great source of protein, a well-cooked steak is a joy to behold…and even better to eat. We all have our preferences – rare, medium or well done – and it can be a cooking challenge to get the end result spot on, but it is so worth the culinary effort. And when cooked outside on a well-fired up barbeque, there is no beating that delicious, chargrilled taste! But with all that care needed to cook the perfect steak, no ordinary knife will do when you come to chow down…a steak knife is the only way to go. Designed to take the hack and grind out of slicing your T-bone or sirloin, you’ll be able to carve away at that succulent 10-ounce steak until your plate is wiped clean. When looking for a steak knife set there are certain key things you really need to consider. Firstly, the blade, although this is a personal choice. Serrated blades mean they don’t need sharpening but can be more of a hack rather than a smooth slice when it comes to cutting your steak. 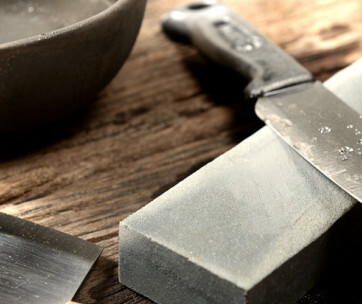 A fine, straight-edged blade gives you more of that ‘cutting through butter’ feel but these steak knives do need regular sharpening maintenance. The size of the blade also matters, the smaller the blade length (between five and seven inches), the cleaner the cut and when it comes to stability and durability, you want the blade to go the full length – or tang – of the knife’s handle. So, there you have it. Now you know what you should be looking for in your perfect steak knife, read on…we are about to match you with your ideal steak slicing partner! This solidly made AmazonBasics Premium Steak Knife Set would be our best steak knives choice on just price and looks alone but it is the performance of these steak knives that really do elevate them beyond the basic. 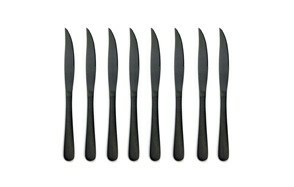 An ample eight-knife set from the AmazonBasics range, this is a perfect starter set that is designed to last. These knives have all the hallmarks of a more premium-priced steak knife set – substantial stain-resistant steel and a long, serrated blade that extends deep within the full length of the handle for balance and comfort. The triple-riveted handle also gives a secure feel in your hand as you cut. The micro-serrated blade doesn’t need sharpening and their classic steak knife looks will add weight to any dinner party, BBQ or grill night. And, despite the price, these are surprisingly substantial serrated steak knives, that are well-equipped to take on the toughest of cuts, and its slice is sufficiently clean. The long handle also keeps your fingers a safe distance from the sharp end of the business. We’d say this knife set is also a good buy as a housewarming gift for friends moving into their new home as they are a great starter set that will more than stay the steak slicing distance. However, these knives are handwash only, so not suitable for the dishwasher. The Avanta is a four-piece set from master knife-makers Messermeister that means serious slicing business. With a host of subtle and not so subtle features, this steak knife set makes carving your steak a cut above some of the more expensive sets out there. With its straight five-inch blade seriously sharp, the Avanta also has an upswept boning edge to seamlessly separate your steak from its T-bone, while it’s fine edge neatly slices through all types of meats and joints. Made from high carbon stainless steel, the lightweight straight blade will need some maintaining to keep its edge, but nothing a good quality knife sharpener couldn’t whip into shape when needed. The stainless steel is also rust-resistant and holds its edge retention, meaning these knives are low maintenance and hardworking. Made from one piece of steel, the balance, and feel of these top-rated steak knives is also easy on the hand, with the full tang of the blade running the length of the three-riveted wooden handle for a solid grip. A handsome steak knife set that totally means business. But if you’re in any doubt, there’s the ‘Knife for Life’ lifetime warranty to reassure you. Now here’s a high-quality steak knife set that provides eight super-sharp straight edge blades in a cool, minimalist design. Complete with a handcrafted walnut wood storage block, Cangshan S1 Series is a heavyweight set of steak knives that you would be proud to bring to the dining table. Sleek in design, this is a steak knife set that wants to make an impact, and with its mid-range price tag, it simply oozes affordable quality. Made from German high alloy stainless steel, these steak knives are both strong and durable, but with a superior edge that glides through meat as if it was butter. Heat-rated, the five-inch edge retains its sharpness for longer gaps between sessions with a knife sharpener and its stainless steel rates high on the Rockwell Hardness Scale. The knife handles have been ergonomically designed for a secure, comfortable grip and the fine balance of the blade and handle means it stays nice and stable in your hand. When it comes to a putting on a full roast or barbecue, these knives are also a great companion to any carving electric knife, cleanly slicing through all the sides of meat on your plate. 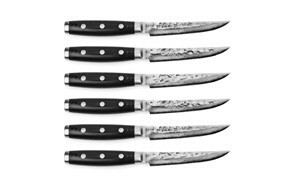 This eight-piece set from precision kitchenware makers Cangshan may not be your everyday go-to stainless steel steak knives but for those steak nights where you want to make an impact, the S1 series will help you to put on a good show. Laguiole Style Steak Knives from Flying Colors have some nice French savoir-faire without the high style price tag. Modeled on the revered Laguiole design – a distinct, pocket knife shape originating from the small French town of Laguiole – at just over 20 bucks, these steak knives offer great value for money. Coming in at a long nine inches for both blade and handle, these stainless steel steak knives are a good buy for everyday use but have top end restaurant looks. There’s a three riveted, the hollow handle for strength without packing on the weight, meaning they sit lightly and comfortably in your hand. The polished and ground blade itself is fine enough at 1.5mm and its serrated edge sufficiently sharp to make easy slicing work of most meat. As well as stainless steel, they also come in a choice of rainbow multi-colored handles to bring some funky style to your table and there’s a distinct bee motif stamped onto the top of each knife, adding a little Laguiole fun to dinner time. They are also dishwasher safe and come in a nice presentation box so make a good gift for the foodie in your life. Time to go old school with J.A. Henckels steak knife set, which for just under $100, comes in a slick mahogany finish box that will bring a bit of culinary glamor to the dining table. Containing eight nine-inch steak knives, this set will more than cater for all your meat-eating diners’ needs, with super tough but surprisingly sharp serrated blade edges to cut through the sirloin with minimum fuss. These serrated steak knives are made from lightweight but robust high-carbon stainless steel so can make easy work of even the toughest joints and their one-piece design means they will match the rest of your stainless steel cutlery. To keep your hand relaxed, the handle area is cleverly angled to protect your wrist when you need to put a bit more cutting pressure on. The blade and handle are also of equal length meaning the balance in your hand is light and natural, despite the total size of each steak knife. And, thanks to their rust-resistant design, these steak knives from renowned German company J.A Henckels are a dream to keep clean and are dishwasher safe, although the makers do recommend they are hand washed. For more great kitchen cutlery, check out our guide to the best meat cleavers. Now’s here’s a super stylish steak knife set made by Las Vegas kitchenware specialists Foxel, that not only looks good but slices fine too, all without breaking the bank. The razor-sharp straight edge on these top-rated steak knives means business when it comes to your ribeye or sirloin and cuts deliciously smooth through most meats. Made from high quality German stainless steel, the easy-grip handle is triple riveted for security and stability, but the whole knife is lightweight enough to sit comfortably in your hand. There’s a full tang to the handsome black handle too, meaning these kitchen knives are super durable and the blade stays impressively sharp between sessions with the knife sharpener. Coming in a complete set choice of either six or 12 steak knives, there’s enough in this pack to cover your more than average dinner party or steak night and they’ll look good on the table. Black Steak Knives Knife Set also comes in a rather smart gift presentation box so would make a good present for your steak-loving friends. Note: these good steak knives are not dishwasher safe but do come with a one-year satisfaction guarantee. Be sure to combine this with a good chopping board from our list. If you’re looking for a birthday or Christmas gift for a steak-loving friend, then this bargain-priced steak knife set from La Mongoose could well hit the mark. A handsome looking six-piece set, complete with its own beech wood presentation box, the La Mongoose steak knife set is certainly an impressive gift and, at around $30, the price is a head-turner too. But what about the performance of these steak knives, or is it simply all style over substance? Well, at five inches they are amongst the smallest steak knives in this review, but their short length means that they hold really well in the hand. And, with a full tang through to the end of the handle, there’s a nice balance to how they feel. 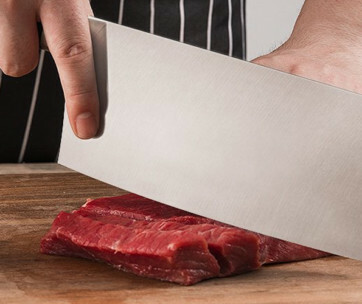 These lightweight steak knives are made from high carbon stainless steel and come with a micro-serrated fine edge, giving a much better slice rather than a full serrated carve for a cleaner cut. And the blade’s tapered tip is ideal for neatly separating any meat from the bone. 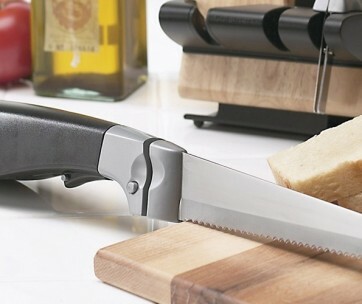 The design and materials used for the blade promise a long shelf-life for these steak knives, with the edge impressively holding on to its sharpness for quite some time. The handle is also ergonomically designed for comfort and made from pakkawood, which comes in an attractive redwood color. All-in-all, a really impressive steak knife set that looks hardy with a touch of old-school style. Using traditional Japanese styling here’s a seriously sharp set of steak knives that will bring top chef knife precision to your table. There’s no doubting this Kasai steak knife set from Bokashi Steel is a handsome quartet, but it is their performance that really catches the eye. For four knives, this set comes in at just under $100 but you get a lot of craftsmanship for your dollar. Made from Japanese AUS-10V, which is highly refined, high-carbon, vanadium stainless steel, these five-inch steak knives are given a razor-sharp edge that is retained for an impressively long time. All the spec you would expect from these quality steak knives is there – a full tang blade, three rivet handle made from mahogany colored pakkawood and a comfort handle design. Plus, there is an extra wide blade which, the makers say, allows for more wrist control and knife durability. The weight of each steak knife is also spot on, with the balance throughout the whole blade giving you precision meat slicing action. In short, channel your inner Samurai at the dinner table and make light work of the largest of steaks with these super Kasai steak knives. Be sure to also check out our list of the best bread knives for more great items like this. The Enso is the total heavyweight of our top-rated steak knives review, both in reputation and design. They are also at the top end of the budget, with a set of six high-quality steak knives for just shy of $400, making them a real investment piece. There’s no denying these steak knives are almost a work of art: Handcrafted in Seki City, Japan, the 37-layer blade comes complete with a stunning hammered surface and the Enso mark, which includes the Japanese symbol for harmony. And when it comes to slicing meat, this is just how these steak knives work. At nine inches, these are substantial steak knives that are razor sharp. Made from Damascus stainless steel, the Enso offers excellent edge retention, ensuring longer times between sessions with the knife sharpener. The full tang blade and handle construction looks seamless and offers superior quality durability and balance. There’s no denying these steak knives are almost a work of art: Handcrafted in Seki City, Japan, the 37-layer blade comes complete with a stunning hammered surface and the Enso mark, which includes the Japanese symbol for harmony. And when it comes to slicing meat, this is just how these steak knives work. At nine inches, these are substantial steak knives that are razor sharp. Made from Damascus stainless steel, the Enso offers excellent edge retention, ensuring longer times between sessions with the knife sharpener. The full tang blade and handle construction looks seamless and offers superior quality durability and balance. Our handy guide to the best cheese knives features more helpful products like this, so check them out. If you are wanting to make a real impact at your dinner party, then get your hands on a set of these Matte black titanium steak knives from Briiec and get prepared to totally impress your guests! Stainless steel with a stunning matt black titanium coating, these steak knives will take your meal over to the dark side and add some fine-dining cool to your table. But it’s not all about the looks with these micro-serrated steak knives, they are more than tough enough to cope with all meats and cooking preferences. The titanium surface is not just there to catch the eye, it adds an extra hardness and protects against everyday scratches and surface damage. This eight-piece steak knife set is designed as a seamless piece of stainless steel, with the handle and blade all in one. And while slim, the stainless steel used is also super durable and resists against bends and rust. Although there is no separate handle, these steak knives are surprisingly comfortable and fit securely in your hand as you slice and carve. They could be a tad thicker but don’t be fooled by the delicate nature of these steak knives, they are tough dudes that are as home at everyday meals as they are for more formal dining occasions. Plus, their simple, sleek design means keeping them clean is a dream and they are totally dishwasher safe. A great, super-cool buy. 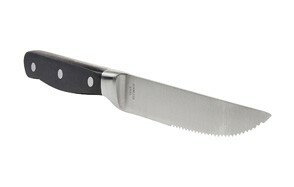 Check out our selection of the best butcher knives and find more great products like this.